It's not a political festival, but it might get political. Literary groups and indie bookstores line the streets of Berkeley for the Bay Area Book Festival. Cherilyn Parsons would like you to know that the Bay Area Book Festival is not a political organization. The Bay Area Book Festival is for readers — for anyone who loves a good book, a "bad" book, a political book, a genre book. It's not an ideas festival, and it doesn't have a political point of view. Parsons, the founder and executive director of the festival, has staked her livelihood on the idea that there is a community that wants to participate in a celebration of books. After three festivals, 800 authors, nearly 100,000 attendees, and an impressive roster for the upcoming fourth edition, it seems she was right. Four years ago, Parsons left her job to start a book festival. She had no experience in publishing or bookselling, save a brief stint in a bookstore a few decades ago. But she was a fan of books, an avid reader, and, as a former Angeleno, had spent many years attending the Los Angeles Times Festival of Books. When she moved to the Bay Area, she was surprised to find that no such event existed here. "There are lots of literary events, but there was no big, free weekend book festival like others around the world," she said. She envisioned the sprawling Bay Area literary community concentrated in one place for one weekend — a tall order, but one she felt uniquely capable of carrying out. Parsons's background is in fundraising, and her work as a consultant in nonprofit journalism brought her to the Bay Area to write grants and raise money for new programs. What she found when she switched focuses was that funding wasn't readily available for the literary event she envisioned. So, Parsons approached her new venture differently, treating it like a startup, working long hours, and selling partners and volunteers on a vision: a free weekend celebration where the guests of honor were booksellers, authors, illustrators, and readers. With the help of the San Francisco Chronicle, KQED, and many volunteers, this idea became the first Bay Area Book Festival in 2015. "There was no money raised when it started," said Parsons. "We were entirely volunteer based the first year and a half." The local literary community showed up. Since that first year, the festival has continued to grow, slowly becoming more sustainable and adding staff to its roster in addition to volunteers. 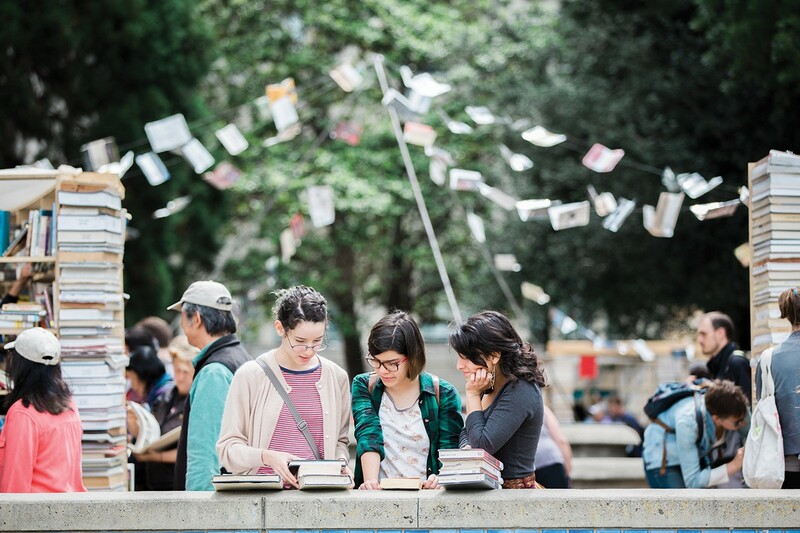 Literary organizations, independent bookstores, local MFA programs, and writing centers line the streets of downtown Berkeley in exhibitor booths, handselling books and courting future customers and students. The national and international literary community showed up, too. "We're lucky because publishers know and love the Bay Area. They send authors to us," Parsons said. "We're highly visible in the universe of book festivals." She described an ecosystem both in the Bay Area literary community and in the literary community at large, with festivals being a part of that. Parsons attends literary festivals every year, trading information and author referrals with other festival directors, and she's even participated in sessions on international festivals at Jaipur BookMark, the literary festival in India. The Bay Area Book Festival takes advantage of the Bay Area's reputation as innovative and forward-thinking. And while it's not political — remember, it's not political — Parsons concedes that the festival consciously reflects "Bay Area values" by discussing topics like diversity, tolerance, sanctuary, racism, and the environment. This year's festival is centered around the theme of "the common good," with opening and closing keynote speeches from Robert Reich and Pico Iyer, respectively. Reich will speak about his book, The Common Good, and Iyer will talk about literature's potential to foster understanding and increase empathy. One session at this year's festival will feature political commentator and author Sally Kohn, who published The Opposite of Hate earlier this month. Shortly afterward, two Black women, Aminatou Sow and Ijeoma Oluo, shared that their words were misrepresented — and in Sow's case, incorrect — in the book. Kohn, a white woman, apologized to Sow, and her publisher removed Sow's name and quote from digital and future editions of the book. At Sow's request, the publisher also donated $500 to the Radical Monarchs, an Oakland-based social justice troop for young girls. The quote in question was particularly violent and that could subject Sow to harassment and targeted abuse online, a problem that affects Black women as well as other minorities and people of color at disproportionate rates, according to Color of Change and probably anyone who has ever spent more than five minutes on Twitter. The conversations that have taken place with and about Kohn since the controversy have addressed the idea that some bodies can't exist in neutral spaces, that to exist in some bodies is inherently political and to ignore that is very dangerous for those in politicized bodies. One hopes that Kohn will take these lessons learned and bring them to her session at this weekend's festival, because while the Bay Area Book Festival as an organization isn't political, the body politic — the attendees, readers, and authors — frequently is. Parsons hopes the festival, now in its fourth year, better represents the Bay Area community, even going so far as to move the festival to an earlier date to better include local colleges and universities. Additionally, the festival has two new programs that support different marginalized groups. One, Women Lit, is a year-round membership society for people who identify as women. It features programing that emphasizes women's issues and provides members with access to private receptions and events. Another is a partnership with the Federated Indians of Graton Rancheria, initiated by author and chairman of the tribe Greg Sarris. Thanks to this partnership, this year's festival will feature Native writers and will have sessions on Native history. The Graton Writing Project will also produce a printed anthology featuring middle and high school Native students from Sonoma. Earlier this year, the Graton Writing Project hosted an essay contest among those same students and the winners will read excerpts from their essays this Saturday. This weekend's festival won't tell you what to think, and it won't skew toward one political philosophy or another. Rather, it's keen on showing you all the ways in which you can think bigger, think better — which isn't political, it's just good.